In the widely accepted giant impact hypothesis, the Earth-Moon system originates from a collision between two planetary-sized bodies toward the end of Earth accretion. Following such a collision, a circumplanetary disk of molten and vaporized material surrounds the Earth from which the Moon rapidly forms. Our understanding of what happens during this fluid stage of the evolution is poor. The goal of my work here is to forge a connection between the formation process and the lunar composition as observed in the isotopes and chemistry of lunar samples. Over the course of the past two decades, isotope geochemists have observed an increasingly precise match in isotopic abundances of oxygen , titanium , silicon , and tungsten  between rocks derived from Earth's mantle and Moon against a background isotopic heterogeneity among sampled Solar System bodies. The similarity is such as to leave little doubt that these two bodies are derived from the same reservoir. But if the Moon is the result of a collision between two distinct planetary bodies, where is the isotopic evidence for the impacting planet? 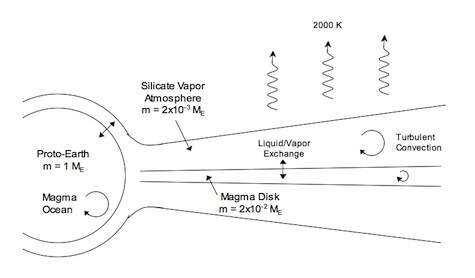 The scenario that I developed with Dave Stevenson is that Earth's magma ocean and the proto-lunar magma disk underwent an episode of isotopic equilibration through exchange with a common vapor atmosphere in the energetic aftermath of the giant impact while the system existed in a fluid state . If turbulent mixing - or any other process - was responsible for deriving the lunar material from Earth's mantle, what is the origin of the chemical differences between these two reservoirs? My work has focused on understanding the FeO enrichment of the lunar mantle , the presence of water in the lunar interior [7, 8], and the development of new isotopic tracers for lunar origin from a circumterrestrial disk . A major new development is the measurement of isotopic differences between the silicate Earth and Moon [e.g. 10] and this is a topic of current study. Wiechert, U. et al. (2001) Oxygen isotopes and the Moon-forming giant impact, Science 294, 345-348. Zhang, J. et al. (2012) The proto-Earth as a significant source of lunar material, Nature Geosciences 5, 251-255. Armytage, R. et al. (2012) Silicon isotopes in lunar rocks: Implications for the Moon's formation and the early history of the Earth, Geochem. Cosmochem. Acta 77, 504-514. Touboul, M. et al. (2007) Late formation and prolonged differentiation of the Moon inferred from W isotopes in lunar metals, Nature 450, 1206. Saal, A. et al. (2008) Volatile content of lunar volcanic glasses and the presence of water in the Moon's interior, Nature 454, 192-195. Wang, K., Jacobsen, S. (2016) Potassium isotopic evidence for a high-energy giant impact origin of the Moon, Nature 538, 487-490.